Material of Construction Carbon Steel / AISI 304 / AISI 316 / FRP / Custom Made. Classically scrubbers are classified according to application and structural design namely Spray Tower, Tray tower, Packed Bed Scrubber and Venturi Scrubber. The reason for many scrubber failures is very low turndown ratio and poor operating range. Also other problem relating of scrubbers are scaling, corrosion, poor spray patterns, poor wetting of packing(channelizing), non proper gas distribution in Venturi etc., We studied all these factors and problems and developed scrubber design which will take care of all these points. In thermal power stations, Metal Industry, Coal/material conveying is one of the most important steps. Coal/Material handling system mainly consists of unloading, screening, crushing, stacking, reclaiming and bunker feeding equipment arranged in an optimum configuration. Coal or bulk solids are received at site either by ships or by rail-wagons or by trucks. It is then conveyed for screening and crushing. For smaller capacity plants, either conveyor with traveling tripper or conveyor with telescopic chute is generally used for stacking the crushed coal andreclaimed using bridge type scraper reclaimer or underground reclaim hopper with suitable capacity dozers. We have been widely appreciated in the market for providing supreme quality Scrubbers to the customers. These products are highly demanded by the clients for their effective usage in large scale industries. The entire range is assembled using quality-tested components, under the expert guidance of our team of experienced professionals. Simulated design with flow characteristic simulation. Very high turndown ratio hence wider operating range. Separate slurry preparation system with agitator and homogenizer, enhances scrubbing efficiency. Highly efficient Mist eliminator with more vapor disengagement space to avoid moisture carryover. Provision for mist eliminator cleaning and washing. 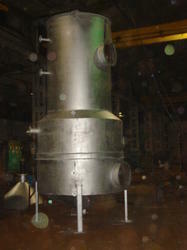 Separate Forced Oxidation tank with provision for mechanical/air agitation for none scaling. Low pressure drop per unit length of scrubber ensures lower operating cost. Incorporated with latest instruments like flue gas analyzers, pH sensors, turbidity meters etc. for easy and trouble free operations. Necessary interlocks and control for long life of equipments. Most uniform gas distribution with rotary vane design and hence largest mass transfer coefficient. Very special unique non clogging nozzles for scrubbing media distribution. Complete system is engineered to avoid scaling, chocking, and corrosion in system. Consistent quality of slurry hence disposal becomes more convenient. Wet Air Scrubber's working is similar to other scrubbing systems in which gases laden with Fumes or dust are accelerated by the Principle of Ventury and are washed or cleaned inside the tower scrubber with the Scrubbing Medium. The turbulence created by the venturies and the interaction with the scrubbing medium effectively cleans the gas of the dust or the Fumes. Whizz offers a wide range of Scrubbers according to the customer requirement. 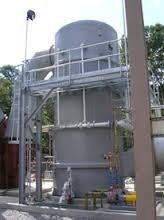 The reason for many scrubbers failure is very low turndown ratio and poor operating range. Other problem relating to scrubbers is scaling, corrosion, poor spray patterns, poor wetting of packing (channelizing), non proper gas distribution in Ventury etc., We studied all these factors and problems and developed scrubber design which overcomes these problems. We first simulate the design, study the flow patterns, correct if any and then prepare final design. With this the scrubber operates satisfactory in the defined operating range. We offer separate slurry preparation system for scrubbing media so that we will get more efficiency with the same system. 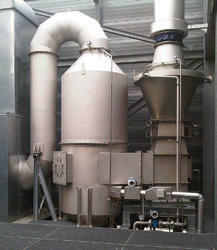 There are specialized scrubber systems available for Flue Gas Desulphurization and NOx removal etc. Scrubbing media: Water / Caustic / Lime / Limestone / Magnesium Oxide / Dual Alkali./Hydrogen Peroxide, etc. Operation: Once through / Recirculation. Venturi Weight Scrubber/ Gas scrubbers play vital role in gas cleaning as they not only separate out the dust but poisonous gases also. Classically scrubbers are classified according to application and structural design namely Spray Tower, Tray tower, Packed Bed Scrubber and Ventury Scrubber. Vertical Air Scrubbers working is similar to other scrubbing systems in which gases laden with Fumes or dust are accelerated by the Principle of Ventury and are washed or cleaned inside the tower scrubber with the Scrubbing Medium. The turbulence created by the venturies and the interaction with the scrubbing medium effectively cleans the gas of the dust or the Fumes. We have been widely appreciated in the market for providing supreme quality of FGD systems to the customers. These products are highly demanded by the clients for their effective usage in large scale industries. The entire range is assembled using quality-tested components, under the expert guidance of our team of experienced professionals. Whizz offers a wide range of FGD systems according to the customer requirement. 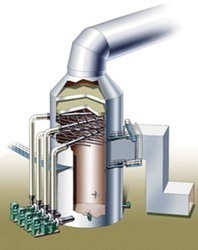 The FGD technology is based on a chemical reaction that occurs when the warm exhaust gases from the coal-fired boiler come into contact with limestone. This reaction removes 92% of the sulphur dioxide from the flue gas and converts the limestone into Calcium Sulphite. Classically scrubbers are classified according to application and structural design namely Spray Tower, Tray tower, Packed Bed Scrubber and Ventury Scrubber. The reason for many scrubber failures is very low turndown ratio and poor operating range. Also other problem relating of scrubbers are scaling, corrosion, poor spray patterns, poor wetting of packing(channelizing), non proper gas distribution in Ventury etc., We studied all these factors and problems and developed scrubber design which will take care of all these points. We first simulate the design, study the flow patterns, correct if any and then prepare final design. With this the scrubber will operate satisfactory in the given operating range. We also offer separate slurry preparation system for scrubbing media so that we will get more efficiency with same system. 1. Construction: Ventury Scrubber / Spray Tower / Packed Tower / Tray Column. 2. 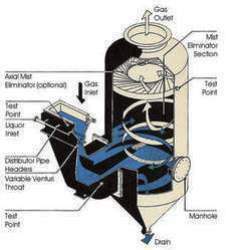 Handling media: Flue gas / Contaminated Air. 3. Scrubbing media: Water / Caustic / Lime / Limestone / Magnesium Oxide / Dual Alkali / Hydrogen peroxide etc. 4. Material of Construction: Carbon Steel / AISI 304 / AISI 316 / FRP / Custom Made. 5. Operation: Once through / Recirculation. Separate slurry preparation system with agitator and homogenizer which enhances the scrubbing efficiency. Low pressure drop per unit length of scrubber, hence lower operating cost. 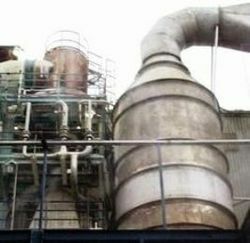 Looking for Industrial Pollution Control Equipment Scubbers ?